Detour 2012, one of the collateral series of events running parallel to Business of Design Week (BODW), officially kicked off on November 29. 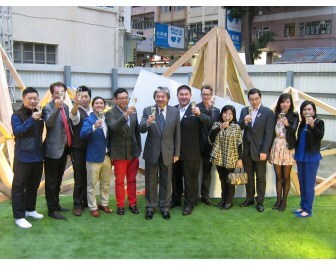 Organized by the Hong Kong Ambassadors of Design (HKAoD), officiating guests of honor for the annual event included John Tsang, Hong Kong’s Financial Secretary. The theme for this year’s event is Design Renegade: Prototyping Public Space, which is expounded in detail by Hong Kong Creative Director Aidan Li, founder of Gaffa Gallery in Sydney and Trends’ On. For the first time since the inception of Detour, two international curators are recruited for this event, including John Bela, renowned artist and co-founder of Rebar Art & Design Studio, and Justine Topfer, independent curator and writer famed for the design works by Out Of The Box Projects. HKAoD Chairman Alan Lo commented, “With Detour held in the Victoria Prison on 2010 and this year’s venue being The Former Wan Chai Police Station, the venue choice may be associated with the loss of freedom. As a vivid contrast, an eclectic mix of artists will let loose their creativity and imagination through their works, indeed echoing the theme this year – renegades of design. Not adhering to common notions, an exciting public space is to be prototyped indeed. In this significant public space more than 80 years old with a cultural history in itself, we will gladly witness original interpretations of public space from local and overseas artists, poignant insight for us on contemplating the same topic.” Overseas and local artists created installations and exhibits which span a wide range of genres. In addition, there are also Makers’ Fair, workshops, artist talks and forums. Detour 2012 is currently running until December at the Former Wan Chai Police Station and the vacant lot of Former Wan Chai Police Married Quarters.